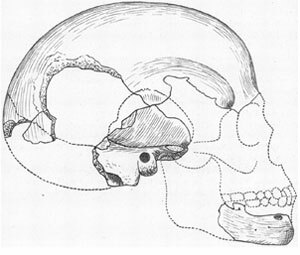 A sketched reconstruction of the Boskop skull done in 1918. Shaded areas depict recovered bone. The following text is an excerpt from the book Big Brain by Gary Lynch and Richard Granger, and it represents their own theory about the Boskops. The theory is a controversial one; see, for instance, paleoanthropologist John Hawks’ much different take. Copyright © 2008 by the authors and reprinted by permission of Palgrave Macmillan, a division of Macmillan Publishers Limited. All rights reserved. These Afrikaner farmers, to their lasting credit, had the presence of mind to notice that there was something distinctly odd about the bones. They brought the find to Frederick W. Fitz­Simons, director of the Port Elizabeth Museum, in a small town at the tip of South Africa. The scientific community of South Africa was small, and before long the skull came to the attention of S. H. Haughton, one of the country’s few formally trained paleontologists. He reported his findings at a 1915 meeting of the Royal Society of South Africa. “The cranial capacity must have been very large,” he said, and “calculation by the method of Broca gives a minimum figure of 1,832 cc [cubic centimeters].” The Boskop skull, it would seem, housed a brain perhaps 25 percent or more larger than our own. The idea that giant-brained people were not so long ago walking the dusty plains of South Africa was sufficiently shocking to draw in the luminaries back in England. Two of the most prominent anatomists of the day, both experts in the reconstruction of skulls, weighed in with opinions generally supportive of Haughton’s conclusions. The Scottish scientist Robert Broom reported that “we get for the corrected cranial capacity of the Boskop skull the very remarkable figure of 1,980 cc.” Remarkable indeed: These measures say that the distance from Boskop to humans is greater than the distance between humans and their Homo erectus predecessors. Might the very large Boskop skull be an aberration? Might it have been caused by hydrocephalus or some other disease? These questions were quickly preempted by new discoveries of more of these skulls. As if the Boskop story were not already strange enough, the accumulation of additional remains revealed another bizarre feature: These people had small, childlike faces. Physical anthropologists use the term pedomorphosis to describe the retention of juvenile features into adulthood. This phenomenon is sometimes used to explain rapid evolutionary changes. For example, certain amphibians retain fishlike gills even when fully mature and past their water-inhabiting period. Humans are said by some to be pedomorphic compared with other primates. Our facial structure bears some resemblance to that of an immature ape. Boskop’s appearance may be described in terms of this trait. A typical current European adult, for instance, has a face that takes up roughly one-third of his overall cranium size. Boskop has a face that takes up only about one-fifth of his cranium size, closer to the proportions of a child. Examination of individual bones confirmed that the nose, cheeks, and jaw were all childlike. Boskops, then, were much talked and written about, by many of the most prominent figures in the fields of paleontology and anthropology. The history of evolutionary studies has been dogged by the intuitively attractive, almost irresistible idea that the whole great process leads to greater complexity, to animals that are more advanced than their predecessors. The pre-Darwin theories of evolution were built around this idea; in fact, Darwin’s (and Wallace’s) great and radical contribution was to throw out the notion of “progress” and replace it with selection from among a set of random variations. But people do not easily escape from the idea of progress. We’re drawn to the idea that we are the end point, the pinnacle not only of the hominids but of all animal life. Boskops argue otherwise. They say that humans with big brains, and perhaps great intelligence, occupied a substantial piece of southern Africa in the not very distant past, and that they eventually gave way to smaller-brained, possibly less advanced Homo sapiens—that is, ourselves. We have seen reports of Boskop brain size ranging from 1,650 to 1,900 cc. Let’s assume that an average Boskop brain was around 1,750 cc. What does this mean in terms of function? How would a person with such a brain differ from us? Our brains are roughly 25 percent larger than those of the late Homo erectus. We might say that the functional difference between us and them is about the same as between ourselves and Boskops. Expanding the brain changes its internal proportions in highly predictable ways. From ape to human, the brain grows about fourfold, but most of that increase occurs in the cortex, not in more ancient structures. Moreover, even within the cortex, the areas that grow by far the most are the association areas, while cortical structures such as those controlling sensory and motor mechanisms stay unchanged. Going from human to Boskop, these association zones are even more disproportionately expanded. Boskop’s brain size is about 30 percent larger than our own—that is, a 1,750-cc brain to our average of 1,350 cc. And that leads to an increase in the prefrontal cortex of a staggering 53 percent. If these principled relations among brain parts hold true, then Boskops would have had not only an impressively large brain but an inconceivably large prefrontal cortex. The prefrontal cortex is closely linked to our highest cognitive functions. It makes sense out of the complex stream of events flowing into the brain; it places mental contents into appropriate sequences and hierarchies; and it plays a critical role in planning our future actions. Put simply, the prefrontal cortex is at the heart of our most flexible and forward-looking thoughts. While your own prefrontal area might link a sequence of visual material to form an episodic memory, the Boskop may have added additional material from sounds, smells, and so on. Where your memory of a walk down a Parisian street may include the mental visual image of the street vendor, the bistro, and the charming little church, the Boskop may also have had the music coming from the bistro, the conversations from other strollers, and the peculiar window over the door of the church. Alas, if only the Boskop had had the chance to stroll a Parisian boulevard! Expansion of the association regions is accompanied by corresponding increases in the thickness of those great bundles of axons, the cable pathways, linking the front and back of the cortex. These not only process inputs but, in our larger brains, organize inputs into episodes. The Boskops may have gone further still. Just as a quantitative increase from apes to humans may have generated our qualitatively different language abilities, possibly the jump from ourselves to Boskops generated new, qualitatively different mental capacities. We internally activate many thoughts at once, but we can retrieve only one at a time. Could the Boskop brain have achieved the ability to retrieve one memory while effortlessly processing others in the background, a split-screen effect enabling far more power of attention? Each of us balances the world that is actually out there against our mind’s own internally constructed version of it. Maintaining this balance is one of life’s daily challenges. We occasionally act on our imagined view of the world, sometimes thoroughly startling those around us. (“Why are you yelling at me? I wasn’t angry with you—you only thought I was.”) Our big brains give us such powers of extrapolation that we may extrapolate straight out of reality, into worlds that are possible but that never actually happened. Boskop’s greater brains and extended internal representations may have made it easier for them to accurately predict and interpret the world, to match their internal representations with real external events. Perhaps, though, it also made the Boskops excessively internal and self-reflective. With their perhaps astonishing insights, they may have become a species of dreamers with an internal mental life literally beyond anything we can imagine. Even if brain size accounts for just 10 to 20 percent of an IQ test score, it is possible to conjecture what kind of average scores would be made by a group of people with 30 percent larger brains. We can readily calculate that a population with a mean brain size of 1,750 cc would be expected to have an average IQ of 149. This is a score that would be labeled at the genius level. And if there was normal variability among Boskops, as among the rest of us, then perhaps 15 to 20 percent of them would be expected to score over 180. In a classroom with 35 big-headed, baby-faced Boskop kids, you would likely encounter five or six with IQ scores at the upper range of what has ever been recorded in human history. The Boskops coexisted with our Homo sapiens forebears. Just as we see the ancient Homo erectus as a savage primitive, Boskop may have viewed us in somewhat the same way. They died and we lived, and we can’t answer the question why. Why didn’t they outthink the smaller-brained hominids like ourselves and spread across the planet? Perhaps they didn’t want to. Longer brain pathways lead to larger and deeper memory hierarchies. These confer a greater ability to examine and discard more blind alleys, to see more consequences of a plan before enacting it. In general this enables us to think things through. If Boskops had longer chains of cortical networks—longer mental assembly lines—they would have created longer and more complex classification chains. When they looked down a road as far as they could, before choosing a path, they would have seen farther than we can: more potential outcomes, more possible downstream costs and benefits. As more possible outcomes of a plan become visible, the variance among judgments between individuals will likely lessen. There are far fewer correct paths—intelligent paths—than there are paths. It is sometimes argued that the illusion of free will arises from the fact that we can’t adequately judge all possible moves, with the result that our choices are based on imperfect, sometimes impoverished, information. Perhaps the Boskops were trapped by their ability to see clearly where things would head. Perhaps they were prisoners of those majestic brains. There is another, again poignant, possible explanation for the disappearance of the big-brained people. Maybe all that thoughtfulness was of no particular survival value in 10,000 B.C. The great genius of civilization is that it allows individuals to store memory and operating rules outside of their brains, in the world that surrounds them. The human brain is a sort of central processing unit operating on multiple memory disks, some stored in the head, some in the culture. Lacking the external hard drive of a literate society, the Boskops were unable to exploit the vast potential locked up in their expanded cortex. They were born just a few millennia too soon. In any event, Boskops are gone, and the more we learn about them, the more we miss them. Their demise is likely to have been gradual. A big skull was not conducive to easy births, and thus a within-group pressure toward smaller heads was probably always present, as it still is in present-day humans, who have an unusually high infant mortality rate due to big-headed babies. This pressure, together with possible interbreeding with migrating groups of smaller-brained peoples, may have led to a gradual decrease in the frequency of the Boskop genes in the growing population of what is now South Africa. Then again, as is all too evident, human history has often been a history of savagery. Genocide and oppression seem primitive, whereas modern institutions from schools to hospices seem enlightened. Surely, we like to think, our future portends more of the latter than the former. If learning and gentility are signs of civilization, perhaps our almost-big brains are straining against their residual atavism, struggling to expand. Perhaps the preternaturally civilized Boskops had no chance against our barbarous ancestors, but could be leaders of society if they were among us today. Maybe traces of Boskops, and their unusual nature, linger on in isolated corners of the world. Physical anthropologists report that Boskop features still occasionally pop up in living populations of Bushmen, raising the possibility that the last of the race may have walked the dusty Transvaal in the not-too-distant past. Some genes stay around in a population, or mix themselves into surrounding populations via interbreeding. The genes may remain on the periphery, neither becoming widely fixed in the population at large nor being entirely eliminated from the gene pool. Just about 100 miles from the original Boskop discovery site, further excavations were once carried out by Frederick FitzSimons. He knew what he had discovered and was eagerly seeking more of these skulls.